NETWORK FINALS: NCIS: LA and the 8PM TO TELL THE TRUTH gained 0.1 in final numbers, while DATELINE lost the same. CABLE HIGHLIGHTS: Viewers desperate for football crowded to ESPN’s coverage of the PRO BOWL, down two-tenths from last year’s game to 2.56. (The network’s early morning AUSTRALIAN OPEN coverage was at 0.39.) Bravo’s REAL HOUSEWIVES OF ATLANTA dominated the regular series, up 0.05 to 1.09, with FIRST FAMILY OF HIP-HOP steady at 0.38. Discovery’s ALASKA: THE LAST FRONTIER had a 0.11 bump to 0.64. The SAG AWARDS were telecast on both TNT and TBS and scored 0.60/0.57, up quite a bit from last year’s Saturday ceremony at 0.41/0.27. On Food Network, WORST COOKS IN AMERICA dropped 0.05 to 0.58, and GUY’S GROCERY GAMES climbed 0.09 to 0.46. 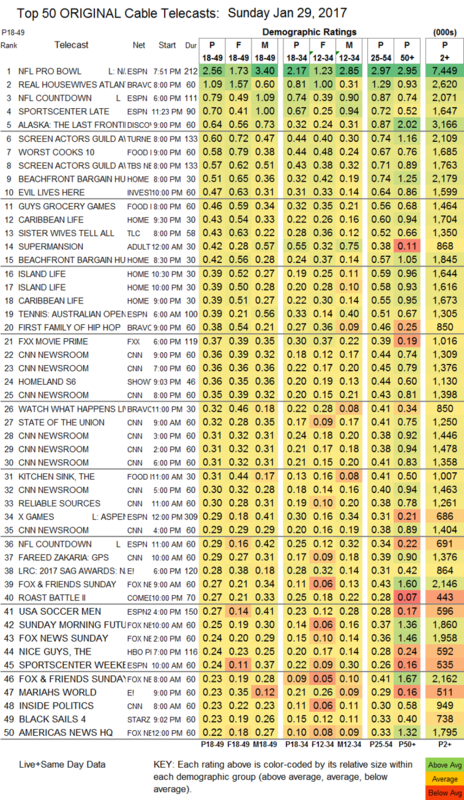 HGTV’s BEACHFRONT BARGAINS hit the Top 10, up 0.12 to 0.51. ID’s EVIL LIVES HERE rose 0.11 to 0.47. 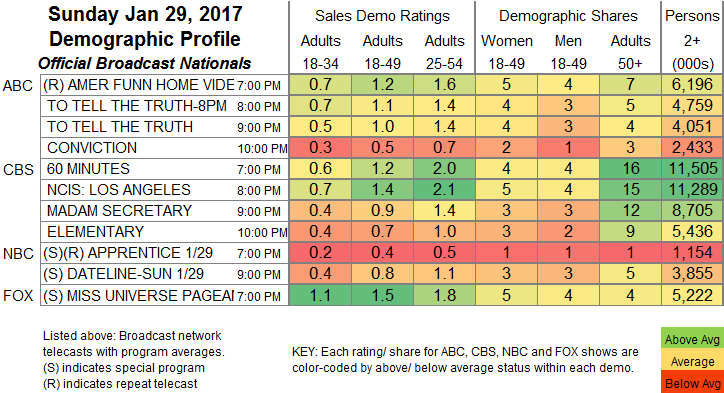 On TLC, SISTER WIVES TELL ALL slipped 0.03 to 0.43, and LONG LOST FAMILY was up 0.03 to 0.17, with MARRIED BY MOM & DAD up 0.05 to 0.16. Adult Swim’s SUPERMANSION held at 0.42, leading the night’s scripted programming. On Showtime, HOMELAND fell a tenth to 0.36, and the season finale of THE AFFAIR was up 0.04 to 0.22. On E!, after MARIAH’S WORLD lost 0.02 to 0.23, THE ROYALS was down 0.03 to 0.20. The final season premiere of Starz’s BLACK SAILS was at 0.23, down 0.04 from last year. HBO’s THE YOUNG POPE rose 0.03 from last Sunday’s episode to 0.20.